Feel prepared to introduce a study of parallelograms! 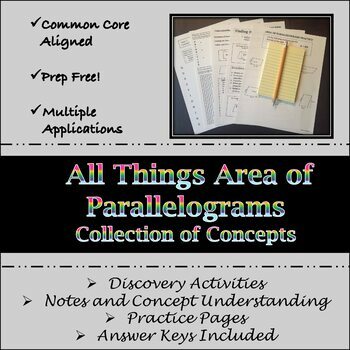 This collection of parallelogram concepts and activities is student centered and encourages student questioning and discovery. Application of prerequisite knowledge to make sense of the current application is required. Lessons are designed to evoke valuable student to student interactions and discourse, as well, question lead discovery. Let them wonder and be amazed by where they go! !